To discover Sofia better, make sure you read this detailed travel guide that includes local tips for the city. The beautiful capital of Bulgaria, Sofia is probably one of the most underestimated cities in the world. It is not mentioned in the lists that include world’s most fascinating cities, or you cannot come across its name in a blog post called “9 European Cities that Must be Visited” however, this sort of adds to the mysterious beauty of Sofia and the visitors’ fascination doubles since it sort of makes them feel like they have found a hidden gem. 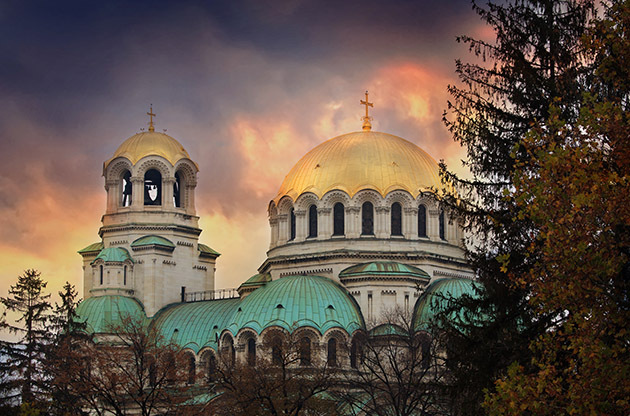 Home to almost 1.3 million living in Bulgaria, Sofia is the cultural hub of the country. While it shows a full European attitude with its universities, business centers, cultural activities and living style, the city has been quite successful at preserving the historical heritage that has been shaped by different nations throughout the time. Sofia offers an authentic journey to its visitors; there are so much places of interest that truly deserve a visit. All these serve as an introduction to the city’s historical and cultural perspective. Despite all the European features, a visitor can make the most out of his time in Sofia by experiencing fully Bulgarian customs and traditions. One of the other things that will turn your travel into an unforgettable journey in Sofia is the hospitability of Bulgarian people. They are a nation known with the warm-bloodedness and kindness. Even if you don’t speak Bulgarian, you are going to see the desire to help you in people’s eyes. This, when combined with all the natural and cultural beauty the city has, turns Sofia into a great place to explore, fall in love and remember with a smile all the time. Sofia is located on the western part of the country, at the center of Balkan Peninsula. Sofia Airport is the most crowded one among the other airports in the country. It is located only 10 minutes from the city center and it is on the eastern part of the city. If you are going to fly to Sofia from another continent, nearby countries’ airports will probably be your interchange stop. There are shuttles, taxis and private cars you can use to get to the city center from the airport. If you are traveling to Sofia from Europe, for example from Kiev, Istanbul, Vienna, Belgrade, Bucharest or Moscow, you may as well take the train. Sofia has got an efficient local transportation system and it is easy for visitors to use it without getting confused. The official website of Sofia Public Transportation provides information about subway, bus and tram lines. You always have the option to rent a car in Sofia however it is not advised since it is highly probable that traffic will be stuck, especially in the rush hours. The downtown Sofia is highly accessible for pedestrians. Sofia is very generous when it comes to meet the visitors’ needs to discover and enjoy the city. There a large number places to see and museums and all of these is going to nourish your hunger for intellectual knowledge. In addition, Sofia has got plenty of restaurants where you can try the tasty dishes of the Bulgarian cuisine. Of course, when it comes to shopping, you are going to have a bunch of options; you can visit malls or you can wander around bazaars or stores which sell more traditional items. If you like visiting holy places during your travels, then you can consider yourself more than lucky in Sofia. There are many churches and cathedrals, as well with mosques that stand out from the others with their unique design. St. Alexander Nevsky Cathedral is one of the biggest orthodox churches not only in Europe but also in the whole world. Boyana Church and Church of St. George are the other two churches that surely deserve a visit. Sofia takes good care of the museum lovers as well. National Museum of History and National Museum of Natural History are visited by the visitors frequently. If you would like get to know more about the Bulgarian culture, then you can visit the Institute of Ethnology and Folklore Studies with Ethnographic Museum. In addition, National Assembly of Bulgaria, SS. Cyril and Methodius National Library, Amphitheatre of Serdica and Knyaz Battenberg's Palace are among the other places you must include on your list when in Sofia. The most crowded shopping area in Sofia is a street. Vitosha Boulevard offers the visitors a high scale shopping experience. You may come across brands’ stores you are already familiar with. Still, it is a nice place to see. There are also nice cafes and restaurants, so you can enjoy a cup of coffee between your shopping. The market in font of Nevski must be visited if you are interested in antiques. You can find items from the communist era. Don’t forget it is one of the places that’s visited by the tourists, so it is almost always very crowded. If you would like make some regular shopping, then you can go to Mall of Sofia, Bulgaria Mall or SkyCity Mall. Pirotska Street is filled with stores and boutiques that you can buy the beautiful Bulgarian souvenirs. Thanks to the young population of Sofia and the clubs that are open until the early morning lights, the city has got a vibrant nightlife scene. In addition, the alcohol prices are low when compared to the other European cities, and this also contributes to city’s turning into a dance floor, especially on weekends. Vitosha Boulevard is the heart of the nightlife in Sofia, just as it is the heart of shopping. Most of the high end clubs are located here and you can choose a pub or a club, according your desire, to enjoy a drink or dance. However, if you would like to experience something more local, then you can try the pop folk clubs to see a gypsy orchestra accompanied by female singers. There are so many thing you must try from the Bulgarian cuisine when in Sofia. So it is better to have a list in advance in order to know what to order once you are in a restaurant. In addition, there are so many restaurants that serve some great examples from the other European cuisines. If you think you’ve had enough of the Bulgarian dishes, then you can try the Italian restaurants in the city. Don’t worry if you are finished with the sightseeing in Sofia and have still got a couple of days to spend in the city. There are many more things, most of them being in the heart of nature, you can do. One of the most popular excursions is Sofia is a trip to Vitosha Mountain. It is located only 10km from Sofia city center and no matter what time of the year you visit the place, there will be an attraction. There are many good quality restaurants there, even if you don’t participate in the attractions, you can enjoy your lunch and enjoy the view. Hiking is also very popular among the visitors since it offers a great way to admire the natural beauty of Sofia. There are special routes to choose from; you can choose the length and the place and experience one of the most exciting hiking of your life. Sofia has got some great beaches, too. So if your travel falls in the months of summer, don’t forget to enjoy them. The most famous of them is Happy Beach Viktoria but you can also visit Varadero and Liulin Beach. Sofia is getting more and more important in the world’s event scene as the number of international and national events held in the city increases. Every year the city becomes the host of a large number of congresses, conferences, symposiums, trade shows and fairs. There are venues which are equipped with the highest technology and have got great facilities and these eventually help the city’s popularity in the field of event tourism. When the natural beauty, the vibrant night life and delicious cuisine is also taken into consideration, it can be said that Sofia is going to be one of the top event cities in Europe in a short time.